Not sure how to review this extremely simple but effective device but here goes. 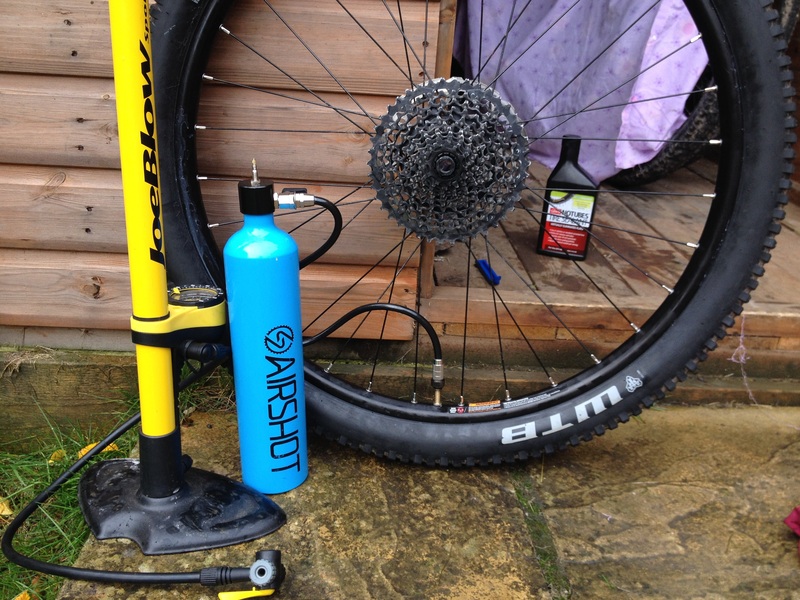 AirShot has been developed to help you with the inflation of tubeless tyres. I have steered away from tubeless as I didn’t really understand the benefits for starters but also there was a concern that I wouldn’t be able to get sufficient tyre pressure, without a compressor. You “fill” the AirShot with a normal track pump – pumping to a max of 11 bar or 160 psi. This effectively results in your having your own little canister of compressed air. Now connect to either Presta or Schraeder valves (it works with both) on your wheel/tyre and release the valve. The compressed air rushes out far quicker than you can pump enough pressure by hand to snap the tyre into place. And that’s it! It really is that simple! It has been a God send for me as I had a tubeless nightmare seating tyres this week (long story). Yes, read the manual (or talk to the bike/rim manufacturer), do some research and don’t be hasty and go out and buy what you think is the right equipment for your tubeless set up! My tyres were NEVER going to seat with the rim strip! I learned today a little about wheel technology and how different wheels are made and that small fissures are possible when the rim is cold joined rather than welded. Wider tape should have sorted this out and Tubeless Round 2 will begin tomorrow. 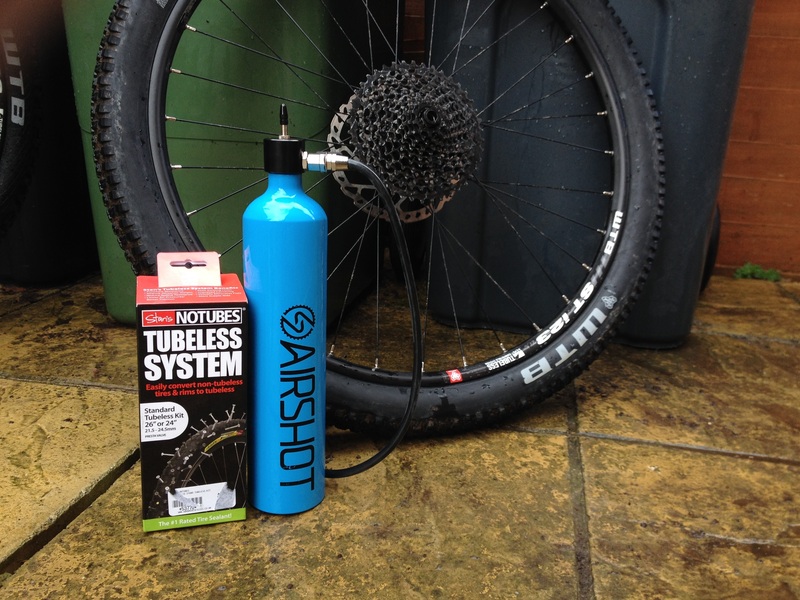 The only thing I got right on my shopping list was the Airshot tyre inflator – thats a great piece of kit and here’s my review of it..
EDIT – After a puncture and burp free day of uplifting at BikePark Wales at the weekend my tubeless efforts paid off. Why is it that after a day on the bike or a long ride home from work the bike is fine, the tyres are firm – but after a night in the shed there’s a flat? It’s not a slow puncture, don’t let anyone tell you that you got a puncture towards the end of your ride and it went down over night. Don’t believe them. The puncture pixies are everywhere. 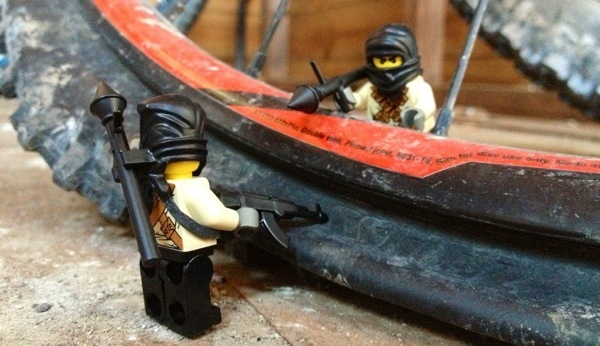 At night when you are sleeping, the manufactures of inner tubes, puncture repair patches and the suppliers of that tubeless mucky gunk send out squadrons of little guys armed to the teeth with all the weapons required to sabotage your ride. In an attempt to sell more tubes, patches and gunk these manufacturers send out the Puncture Pixies to do their evil work. See the photographic evidence above. I have now plugged all the holes in my shed, reduced the gap under the door and made the bike shed pixie proof! Sorry I may have gone a bit mad after spending half my Saturday in IKEA.